1. You’ll discover a little-known chapter of Hollywood history. Why did a relatively small American studio make a foreign-language film in the 1930s? The answer, as usual with Hollywood, can be expressed by a single character: $. With the coming of talkies, the problem of producing films for profitable foreign markets turned into a major headache for Hollywood. Unlike silent films, for which translated intertitles could simply be edited into prints, synchronized sound pictures posed a new obstacle. Dubbing was difficult and felt phony to audiences (like it still does, actually). Eager to keep up business during the early days of the Depression, studios recycled sets, costumes, and sometimes even actors to churn out complete foreign-language versions of some movies. Spanish proved the language of choice for these alternate productions, although studios occasionally green-lit German and French versions. At Universal Studios, a Spanish-language version of the now-lost thriller The Cat Creeps offered Lupita Tovar, a beautiful Mexican actress, her first starring film role. Tovar proved so enchanting that Universal executive Paul Kohner not only championed a Spanish-language Dracula, but also fell in love with its star. Fair warning: once you’ve watched Drácula, you will, too. 2. The flamboyant cinematography makes Browning’s version look positively anemic by comparison. Most alternate foreign-language versions can’t hold a flickering Gothic candelabra to the English originals. Drácula, helmed by veteran silent director George Melford, is the exception, largely thanks to the fluid camera movements, tracing creepy arabesques around the set. You don’t have to wait long for an example of this superb camerawork. Our first glimpse of Dracula in his element practically bursts off the screen. As the sinister count appears on the stairs of his castle, the camera surges up the steps towards him. Universal’s famous crane—constructed for Broadway (1929) and repurposed in any number of films—endows the moment with a startling, supernatural ambiance, delivering a real visual jolt. Similarly, when the Count stands beneath Renfield’s asylum window, the camera tracks in from a long shot to a medium close-up, as though the vampire’s evil will were drawing us to him. In 1931, Universal had recently acquired a print of Nosferatu; Murnau’s grim, nightmarish vision, as well as the German expressionist aesthetic in general, clearly influenced Drácula more than its English-language counterpart. For instance, Melford devotes more screen time to the storm scene on the Vesta, piling shock value on a part of the narrative that Browning uses mostly for expositional purposes. Medium close-ups of the dead captain, Renfield’s shrieks in the gale, and Dracula’s rise from the ship’s hold all hit home for maximum scare power. And isn’t that what this is all about? 3. The luminous Lupita Tovar runs the gamut from adorable to terrifying (even though she’s not called Mina in this version). Rechristened Eva in Spanish, the Count’s main target undergoes a startling transformation when she comes under his malign influence. Tovar’s Eva shifts from a cheerful, normal girl to a morose, haunted victim. Now, I respect Helen Chandler’s stylized, anhedonic performance as Mina, but she hardly changes throughout the film and thus engages my sympathy far less. Tovar says that she put a lot of her own personality into Eva, making her “lively” in the beginning. We see that mischievous side as she insistently teases Lucia about her attraction to Dracula, ducking out from the door she just exited to deliver another friendly jab. Eva’s fearful, depressive state after Dracula’s first attack on her affects viewers all the more since we recognize the frightening trauma that’s overtaken her. With the Count’s blood coursing through her veins, however, Eva turns positively maniacal. Though she’s even livelier that she was before, Tovar evokes a vivacity at once seductive and unnatural. Her fiendishly aggressive, erotically charged interpretation of female vampirism was decades ahead of its time. I mean, Ingrid Pitt wasn’t even born yet! Update 11/13/2016: Lupita Tovar has passed away at age 106. May she rest in peace and be always remembered. 4. Pablo Alvárez Rubio delivers one of the most intense performances you’ll ever see on film. Who would’ve thought anyone could act more strung-out than Dwight Frye, the English version’s giggling Renfield? Well, Spanish-born Pablo Alvárez Rubio reminds me of what Al Pacino would do with the part of Renfield. At one point, he literally chomps the scenery, gnawing on a chair in Dr. Seward’s office! Alvárez Rubio slips into hamminess, but it’s an epic kind of hamminess, the kind that assists us in believing the unbelievable. His frenzied, melodramatic acting in mad scenes impacts us because he starts out the story as such a friendly, likable fellow. (I adore Frye, but his subtly chilly quality as an actor puts us off a bit, in contrast with Alvárez Rubio’s easy affability.) Even once Renfield becomes Dracula’s servant, Alvárez Rubio rivals Frye for his ability to convey the tortured character’s fluctuating moods. One moment he seizes a fly with the fury of a wild beast; the next he filters back to his civilized self, apologizing to the doctors for his behavior. Lupita Tovar remembered that his talent for simulating insanity astounded—and worried—the cast and crew: “We thought he was going to go crazy.” A real pro, though, Alvárez Rubio needed only a single take to harness his morbid pyrotechnics. Treat yourself to his ferociously tormented interpretation of Renfield. 5. It’s significantly longer than the English version. Yup. That’s right. The Spanish version runs almost a full 30 minutes longer, bringing Drácula to a length that seems more appropriate for a modern feature than an early talkie. The additional length does take a toll on the plot, which seems to wander a bit more than the efficient English Dracula. However, on the positive side, the runtime gave director Melford and his cast breathing room to create more poignant relationships between the characters. If I have one issue with the Dracula we all know, it’s that the cast appears only mildly annoyed by the prospect of Mina and Lucy suffering a fate genuinely worse than death. By contrast, the Spanish version explores the pain of watching someone you care about fall apart. After Van Helsing discovers the bite marks on Eva’s throat, her father gives her a hug. His drawn-out, scared, paternal embrace stresses the relatable fear of losing a child. Similarly, Juan and Eva’s romance displays a mixture of tenderness, passion, and even a sparkle of fun that’s missing from the chemistry between Helen Chandler and David Manners. Within that extra half-hour, Melford also took the time to show spooky stuff you won’t see in the other version, such as shots of Dracula prowling through moonlit woods. The brief medical examination scene also presents us with one of the most grisly, yet matter-of-fact shots of the 1930s: an extended close-up of the two puncture marks made by a vampire’s fangs! 6. No, he can’t touch Lugosi, but Carlos Villarías’s interpretation of the Count is certainly interesting to watch. Sadly, the one aspect of Drácula that indisputably falls short of the English version turned out to be the most essential: the title performance. Film historians tend to blame Spanish-born Villarías for the film’s relative obscurity. 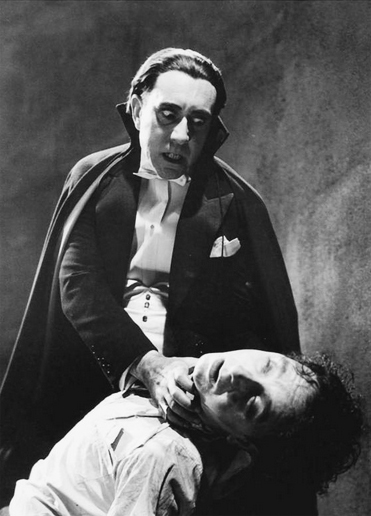 And I won’t deny it: Lugosi’s Dracula has more magnetism in his (unseen) fangs than Villarías’s Conde Drácula does in his whole walking cadaver. How dare you say that, Nitrate Diva! You’re in for it now! But holding an actor accountable for playing Dracula and not measuring up to Lugosi just doesn’t strike me as a sporting criticism. Few actors have ever lent their mortal coil to any role so fully as Lugosi did to our favorite bloodsucking fiend. Nobody stacks up to the king of the undead. You set yourself up for disappointment by expecting otherwise. So, the question to ask—instead of what he lacked—becomes what particular strengths did Villarías bring to the role? In my opinion, the lugubrious heavy served as a kind of missing celluloid link between the pestilential ugliness of Nosferatu and the suaveness of Lugosi. Villarías can believably kiss hands and stride into drawing rooms, but his animalistic nature reveals itself more readily than Lugosi’s. Consider his first big scene, on the steps of Castle Dracula: as Renfield struggles with the huge cobweb, Villarías stares down at him, menacing in a low-angle shot, his upper teeth bared and poised on his lip. Throughout the film, the Conde flashes a similar rat-like smile in moments of diabolic delight and visibly gnashes his teeth when cornered. Unlike the did-I-really-just-see-that hint of a smirk that Lugosi uses to suggest malevolence, Villarías’s toothy expressions make Dracula a more traditionally grotesque monster, a fairy tale horror rather than a bedroom villain. Similarly, in contrast to Lugosi’s balletic predator approach, Villarías attacks the sleeping Lucia by leaning over and eagerly covering her with his cape. As he drapes the cloak over the sleeping victim, he really does resemble a bat, folding his leathery wings. Frequent extreme close-ups of Villarías’s glassy, bulbous eyes also heighten the repellent qualities of his interpretation. Given how jarring they are, it’s surprising to note how many of these extreme close-ups the film contains; you begin to feel that they’re almost as frequent as Lugosi’s many matinee idol close-ups in the English version. These striking shots invade our personal space, as though Villarías as Dracula were bearing down on us, dominating us. And this from a small screen! I can only imagine what they’re like in a movie theater! Reduced to his two glowing peepers, he reminds the viewer of an insect, surveying the world with inhuman, compound eyes. Lugosi deservedly gets the swoons and the shudders, but Villarías deserves some credit for wholeheartedly angling for an “Ewww…” every now and then. I wrote this post as part of the Hollywood’s Hispanic Heritage Blogathon, hosted by two fantastic bloggers, Aurora of Once Upon a Screen and Kay of Movie Star Makeover. You’re strongly encouraged to check out the other posts! This entry was posted in 1930s, Horror, Uncategorized and tagged carlos villarias, dracula, george melford, horror, lupita tovar, nosferatu, pablo alvarez rubio, pre-code, spanish, spanish-language, universal, universal horror by Nitrate Diva. Bookmark the permalink. How wonderful that Tovar is still with us! Splendid & detailed post! Though the Todd Browning English-language version is clearly a flawed film, I’ll always cherish it as a historical artifact as much as a piece of dark entertainment. (I’ll be seeing it in a for-real theatre and on the big screen next week for the very first time, in fact). But there’s little room to argue the points you make…I guess I share them as well! There was an interesting and lengthy article in an older issue of Monsters From The Vault magazine — perhaps a couple years or more back — that compared the two films side by side, right down to minute details. Now, to be fair, the writer was pretty clearly a fan of the Browning version and intent on defending it. But it made for good reading, and did manage to refute a few of the claims made about the Spanish version. No question, though — it’s a must-see film for any vintage horror film fan. Thanks for the great post! This sounds like an utterly mesmerizing film. Thanks for the introduction to this (new to me) film! Great job! I love the Ingrid Pitt reference. You must be a horror fan. Lupita is doing well. Only her eyes aren’t that good. Last year I got an autographed photo from her and her daughter Susan Kohner. I wish we could meet them both as well as Susan’s sons, Chris and Paul Weitz. Timely post as I’m going to a back-to-back Dracula screening next week (well it is almost Halloween) although I don’t think this one is included. I’m such a big fan of the book that I always find movie adaptations a bit of a let down but I do agree this version has its merits – I particularly like the unnerving close up shots that lend a great sense of claustrophobia to the movie. This looks like a great film. Thank you for letting me know about it. Fascinating stuff–I wasn’t aware there was a Spanish version of Dracula, so thank you for enlightening me! Good choice for the Halloween season, as well. Yes, Warner Archive has a 2-movie set of Buster Keaton in FREE AND EASY which also includes the Spanish-language version ESTRELLADOS, for which Buster learned his lines phonetically. There’s also the German-language version of ANNA CHRISTIE (also with Garbo) which will be on Turner Classic Movies on April 3.